The Woodlands Commentary: What's all of this hulabalu about Villa Sports? 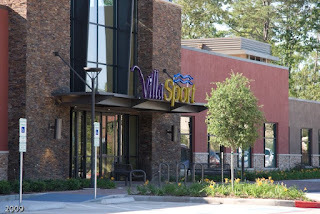 There has been some interest recently in The Woodlands about the new Villa Sports facility on Technology Forest. The significance of the issue is that it may be something for the village association to solve rather than the Township, yet residents went to the Township for help on this issue. Several Panther Creek residents in the back of their property have homes abutting this new facility and are in an uproar. Does it deserve the attention of the Township Board? Apparently, the problem is in the evening and when the kids are out of school. The property was apparently expanded beyond the original plan so that a large water slide would comfortably fit the premises and so the original planned location could be used for other facilities. Now the slide is located on the back of the property close to the residents. Additionally, the pump house and the air conditioners are also placed on the back of the property. The facility closes at 10pm, with its outdoor music (speaker located at the back), foghorns (to get people out of the water) and children playing on the slide. 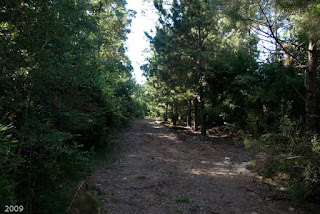 To compensate for the noise, the Woodlands Development Company placed eleven large pine trees in the green area to the back of the facility. There is a small creek, therefore the land of the sports complex had to be raised some four feet. The trees had to be cleared as a result, and so the sports complex now has no natural vegetation remaining on its premises, except for a few small planted bushes and trees. The flow of water does not appear to be an issue nor the lights. It is strictly a noise issue. 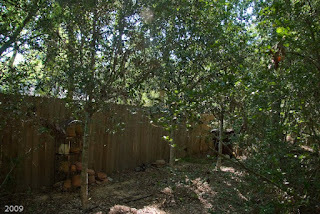 The development company has also placed a few Live Oaks at the back of one of the neighbors home, a two story home more vulnerable to sight issues than the one story homes. 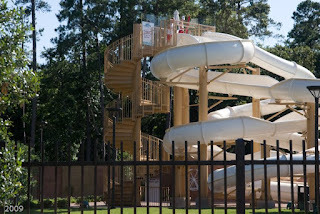 Villa Sports has placed fiberglass panels on three sides at the top of the slide to mitigate noise emitted from the top of the slide. No apparent mitigation has transpired with the remainder of the slide. The work looks to be incomplete, but they certainly have the right approach to the problem. There is about 25 feet of green space, more than adequate to provide a barrier for such a facility. Ambient noise from the pumps and air conditioner behind the facility is equivalent to what one would hear in one of our neighborhoods close to traffic. In fact, I have lived in such a situation for years. This is the time to get the few residents affected and the sports center to reach an agreement. Children yelling on the steps going up to the slide will haunt some residents for years if it is not resolved satisfactorily. I have fair confidence that this will get worked out for all parties affected. The issue will be revisited at the next Township meeting. I am a member with kids and the lifeguards do not use foghorns to clear the pool, they use whistles. This is a great place for the whole family. I am glad that my family has a place to go right here where we live. Sorry, only a few people want to spoil it for all of use that approve of this great place.